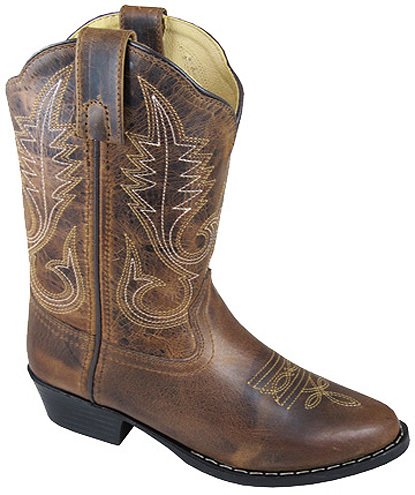 Basic Western cowboy boots might be hard to find, but Cultured Cowboy has plenty of this favorite Waxed brown "Annie" boot. Real leather upper with a soft manmade lining and PVC sole makes this style easy on your feet, and the price is easy on your wallet! PVC sole and manmade liner allow flexibility when playing in your child's boots. Leather outer allows the feet to breath, and the boot to shape to your children's feet. White sole stitching is for looks. It can be carefully dyed black with a fine Sharpie Pen. Keeping a coat of mink oil on the leather will make them look better longer. This way, the child will scuff off the top coat instead of the top layer of leather. Soften with leather balm conditioner. It is Easy to keep them looking good a long time, with just a little care.